Rare glimpse of declaration scroll given as it is photographed with special advanced technology to preserve original appearance. Israel's Declaration of Independence was removed from its special preservation facility on Tuesday in a rare event meant to photograph the cornerstone document establishing the renascent modern Jewish state of Israel. The scroll, which enshrines Israel's status as a Jewish and democratic country, was removed in a joint initiative of the Israel State Archives and Israel Antiquities Authority. It was photographed with special technology developed for the Dead Sea scrolls so as to preserve the original appearance of the scroll for future generations. An advanced multi-spectral photographic system that allows shooting different exposures at various wavelengths - from the visible to the near infrared region of the spectrum - gives information ranging from the texture of the scroll's material to its ink and surface topography. The near infrared exposure will allow characters that have faded over time to be seen as well, showing a precise image of the scroll as it was at its creation - and the creation of the modern state. 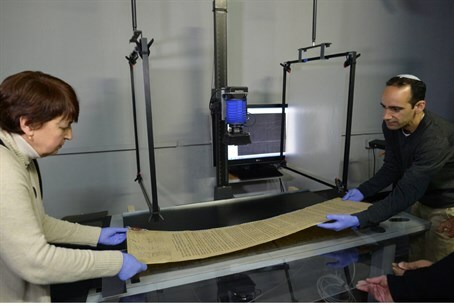 "Today the scroll is stored in an environment with special lighting and temperature conditions, in a secure and guarded facility of the Israel State Archives," said State Archivist Dr. Yaacov Lozowick. "Until a decision is made regarding how the scroll is to be exhibited to the public, we will continue performing various operations aimed at documenting, revealing and preserving the scroll for future generations." "With the unique technology we developed at the Israel Antiquities Authority together with the best scientists in the world, and generous assistance of the Leon Levy and Arcadia Foundations, we are happy to help not only in preserving the material heritage from the distant past but the recent cultural heritage as well," said Pnina Shor, director of the Dead Sea Scrolls Project at the Israel Antiquities Authority. Shor remarked on the symbolism of the photographing, saying "it is exciting and symbolic to document the Declaration of Independence today, one of the cornerstones of the State of Israel, with technology developed specifically for the Dead Sea scrolls - the earliest Hebrew texts, two thousand years old, which were first discovered on the eve of the establishment of the state, at the time when the Declaration of Independence was written." Dr. Mordechai Naor, a writer and historical researcher, described the ceremony proclaiming the state of Israel in his recent book "Great Friday." In it, he noted "because the ceremony was held in Tel Aviv, some of the signatories were unable to arrive because Jerusalem was under siege, and they signed the scroll only a month later, in 'spaces' that were left them specifically for this purpose." "Because the guest lists have not been found to this day, it is not known exactly who the 300 individuals were that were invited to the ceremony proclaiming the state. One person that was almost not allowed to enter was the designated Minister of Justice Pinchas Rosenblüth (Rosen) who forgot to bring his invitation. It was only after Ze'ev Sherf, Secretary of the Situation Committee, intervened was he permitted to enter and thus was also able to sign the Declaration of Independence," revealed Naor. The Declaration of Independence is the first document declaring Jewish sovereignty since the time of the Hasmonean kingdom over 2,000 years ago. The scroll was read as a proclamation of independence, on Friday, the 5th day of Ayar, 5708 (May 14, 1948) in the Tel Aviv Museum, then located at 16 Rothschild Street in the house of the city’s first mayor, Meir Dizengoff. Twenty-five members of the Provisional State Council signed the declaration and twelve others who were in besieged Jerusalem signed it later. The scroll is 117 cm long and 29.7 cm wide. It is made in three parts, and bound on the side with an interwoven thread and a wax seal.